The Pitchers Power Drive training aid teaches backside initiation, pelvic loading, hip lead, momentum, balance, correct drive leg angle, leg drive to extension and lower body power to maximize ground force reaction. The Pitchers Power Drive Science of Pitching video at 1,000 frames per second shows the essential points of a delivery starting from departure. Proper departure is essential and helps set up success for the rest of pitch delivery. It is less than a second to landing from departure of knee lift…..so there is no time for athletic adjustments. Pelvic load and hip lead helps pitchers stay over their back foot longer, setting weight and creating the right drive angle on back leg. This drive leg angle maximizes lower body power and leg drive from a solid foot position to rubber and ground. The Pitchers Power Drive allows foot to be in solid drive contact position creating strong ground force reaction just like in a game. 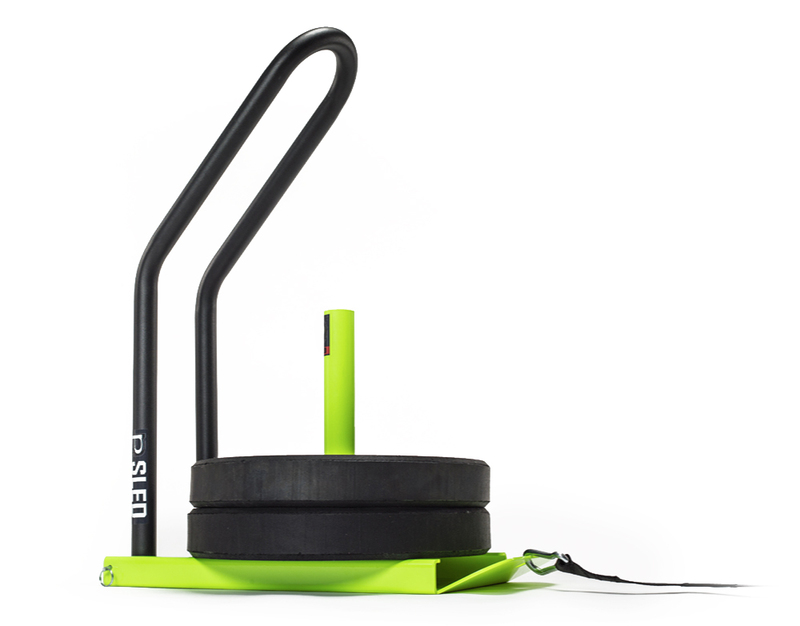 The US Patent pendulum design allows a natural momentum delivery from this solid foot plant. This enables a pitcher to create maximum ground force reaction from leg and foot drive increasing momentum and forces down mound, to longer stride, stronger posting on front leg and faster power torso turn creating good extension at release point. Professional and collegiate coaches are training their pitchers with the Pitchers Power Drive because it teaches the right pelvic load, hip lead, weight distribution, lower body and leg drive to extension just like in game action, staying in contact with the rubber longer. This enables proper leg drive creating more ground force reaction. The auditory and kinetic feedback allows the pitcher to feel and hear when he is doing it right while throwing a baseball. If you squat, drop, fall, leak or drift the pitcher will not hear the Power Drive click at knee lift departure. There are no springs or sliding parts that could cause a pause, hesitation, launch or give resistance to a natural delivery. Learn by throwing live drills to a catcher full distance, hearing the auditory click, feeling kinetic timing of 1/4″ steel striking 1/4″steel. Watching DVD’s being sold for hundreds of dollars will not teach you what the Pitchers Power Drive will. Or will hip wall drills and other drills that do not involve throwing a baseball while hearing and feeling how to perform the proper athletic movements while synchronizing kinetic timing. . There is not a better way to learn than by performing the proper athletic movements with auditory and kinetic feedback while throwing the baseball to a catcher. Increase Pitching Velocity from proper departure to improve the essential important points of a delivery. Pitchers have increased velocity from 4-10 mph with the aid of the “Pitchers Power Drive”. Owners have access to web based training site with 5 day workout program including 23 drills. This workout program teaches to maximize pelvic load, hip lead, proper leg drive angle, leg drive to extension and increases torso energy thus creating more ground force reaction to increase velocity. The original US Patent Pitchers Power Drive was designed by trainers that understand pitching at their 10,000 square foot Winning Pitchers Academy and Research Center in Boston. Using now for 13 years in over 35,000 lessons. That is why there are already 24 Professional, 600+ Collegiate, 3,500+ High School, Travel teams and Academy’s using the Pitchers Power Drive. Most of these team have multiple units 2-12 Pitchers Power Drives. Thousands of professional, collegiate and travel team players are training on Power Drive Performance training aids with great skill improvement, velocity increase and success on the mound. Pitchers Power Drive is available in metal or turf models. Turf allows use of cleats which the professional and collegiate teams requested and use. Pitchers Power Drive Reviews from professional players and coaches. Click Image for review. “THE PITCHERS POWER DRIVE WAS A WONDERFUL NEW ADDITION TO MY OFF SEASON TRAINING. EVERY PLAYER IS ALWAYS LOOKING FOR A WAY TO GET AN EDGE ON THE COMPETITION AND TO MAXIMIZE THEIR ABILITY. THE PITCHERS POWER DRIVE DID BOTH OF THOSE THINGS FOR ME IN PREPARATION FOR THE UPCOMING MAJOR LEAGUE BASEBALL SEASON. IT’S ABILITY TO HELP ME CONSISTENTLY REPEAT MY MOST EFFICIENT DELIVERY IS 2ND TO NONE.NOT ONLY WAS IT PERSONALLY BENEFICIAL BUT IT ALSO TOOK MY PITCHING LESSON CLIENTS TO THE NEXT LEVEL WITH THEIR DELIVERY. THIS TOOL HELPED ME TEACH THE LOAD OF THE HIPS BETTER THAN I EVER HAVE BEFORE. I WOULD RECOMMEND THE PITCHERS POWER DRIVE TO ANY PITCHER OF ANY AGE”! Power Drive Perrformance and Winning Pitchers Baseball Academy is a team of professional trainers that spend thousands of hours each year working hand and hand with pitchers to achieve higher performance. For 15 years we have always done Advance Computer Analysis – ACA for lessons. It is essential for players to visually learn their strengths and opportunity areas while comparing themselves to successful professional players at the same points of their delivery. Just as important as the video analysis is the instructor’s depth of pitching knowledge and his ability to translate this knowledge to the pitcher for improving performance. We work with a multi-sensory learning and re-shaping process that has been highly successful in improving pitchers skills, delivery and velocity. This process includes sets of re-shaping drills that are specific to each individual pitcher. The process is much different than traditional or old ways of teaching pitching. Our process has proven successful with thousands of players. With more players each month traveling to Boston from across the US for Advance Computer Analysis….we wanted to offer our successful training process to all players through Advance Computer Analysis – Live Remote using the same Right View Pro software. We supply a complete analysis with specific “Re- Shaping” drills on video filmed from our Winning Pitchers Academy. We review the Advance Computer Analysis with player. After the player has watched their comparison through RVP Teammate we then connect via phone to go over the analysis and discuss our specific targeted recommendations to improve performance and velocity…..just like you were here in Boston for a live analysis and lesson. Custom drills to improve Pitching Mechanics. Pitchers Power Drive and Winning Pitchers Baseball Academy is a team of professional trainers and coaches that spend thousands of hours each year working hand and hand with pitchers and hitters to achieve higher performance. From our beginning 13 years ago we have always used computer video analysis for lessons. We would never have thought of doing a lesson without the use of Advance Computer Analysis – ACA. It is important for players to visually learn their strengths and opportunity areas while comparing themselves to successful professional players on a computer at the same points of their delivery or swing. Pitchers improve with first lesson and after 4-6 lessons we compare via video to first lesson video and see improvements in all skill areas. The athletes learning process is much faster using Power Drive Performance training aids and advance computer video analysis. Just as important as the video analysis is the instructor’s depth of pitching / hitting knowledge and his ability to translate this knowledge to the pitcher or hitter for improving performance. We remain dedicated to our players for years of instruction to help them achieve their highest potential. We work with a re-shaping process that has been highly successful in improving pitchers skills, delivery and velocity or hitters linear to rotation mechanics for increased bat speed and power. This process includes sets of re-shaping drills that are specific to each individual pitcher or hitter that address his opportunity areas for improvement. The process is much different than traditional or old ways of teaching pitching and hitting. Our process has proven successful with thousands of players we have worked with. We improve every player we work with 10 fold in the lanes and on diamonds with our ACA and re-shaping process. With more players each month traveling to Boston from across the US for Advance Computer Analysis with us ….we wanted to offer our successful re-shaping training process to all players through Advance Computer Analysis – Live Remote. When pitchers travel here monthly from distances we always charge our normal lesson rate just like they lived here in Boston. We will now offer our regular lesson rate with the same successful instruction process through ACA Live Remote……just like you live here in Boston and drove up to the Winning Pitchers Academy and Pitchers Power Drive front door. Our Advance Computer Analysis – Live Remote and lessons use the same Right View Pro software the Professional and Collegiate teams use. We supply a complete analysis with specific “Re- Shaping” drills on video filmed from our Winning Pitchers Academy. Like a live lesson here, we review the Advance Computer Analysis live via computer hook up and phone to go over in detail the analysis, lesson, drills and our specific targeted recommendations to improve performance and velocity…..just like you were here in Boston for a two hour live analysis and lesson. Leg drive to extension creates, power directional momentum and force toward home plate .